Kyal Horsley will undergo reconstructive surgery to his left knee on Tuesday after scans revealed the Gold Coast SUNS midfielder has ruptured his ACL and will miss the remainder of the season. Horsley injured his knee during the second quarter of the GC SUNS NEAFL game against Aspley in Brisbane last Saturday. General Manager - Football Operations, Marcus Ashcroft confirmed that Horsley would have traditional reconstructive surgery. "Unfortunately the scans last week showed that Kyal would require reconstructive surgery to his left knee. Kyal and the Club's medical team have met to discuss the surgery options and he will undergo traditional surgery on the Coast tomorrow." 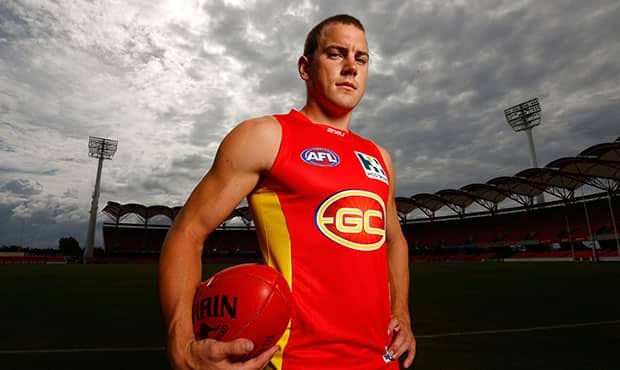 Horsley, 25, has played 14 games with the GC SUNS since making his debut for the club in round 5 2012 against North Melbourne at Etihad Stadium. Horsley’s hard work throughout 2012 was recognised with elevation to the senior list at the end of the season, while at the GC SUNS Club Champion Awards Horsley took out the 2012 Victor Sports Iron Man Award, presented to the player who achieved the most "desire indicators" on-field during the season. Originally from Kalgoorlie City, Horsley won the 2011 Best & Fairest with WAFL club Subiaco where he had played 89 WAFL games and finished second in the Sandover Medal (WAFL’s MVP).